It’s been over a year since Vedanta Resources Plc announced its plan to buy a majority stake in Cairn India Ltd. With the government delaying the deal and later putting onerous conditions to clear it, it’s not surprising that Cairn India’s shares have underperformed the broader market since the deal was announced. But this doesn’t give the full picture of the extent to which Cairn India’s shareholders have lost out. Brent crude prices have risen by 50% since last August, and historically, Cairn India’s shares have been correlated highly with crude prices. 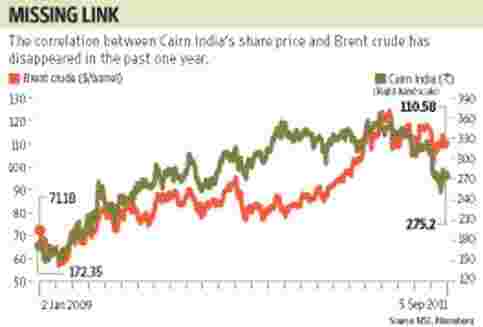 A recent report by Nomura Research points out that between January 2009 and August 2010, the correlation between Cairn India’s share price and Brent crude was high, at 0.94, and that this correlation has been lost since the deal announcement. Nomura’s report, which came out when Cairn India’s shares were trading at ₹ 252 apiece, also pointed out that the shares were factoring in a long-term oil price (Brent) of only $60 ( ₹ 2,754 today) per barrel, or about 45% lower than the prevailing price. The shares have risen by 9% since then, along with the recent rise in crude prices. Even so, at current levels of around ₹ 275, it’s factoring in long-term crude price of around $67 per barrel (based on Nomura’s estimates), which is still 40% lower compared with the current Brent oil price. In other words, the firm’s shares are still suffering because of the uncertainties of the deal with Vedanta, even after the government gave its conditional approval in end-June. Cairn India’s promoter Cairn Energy Plc has agreed to the conditions, and Vedanta, too, can be expected to give its stamp of approval, since the former has already agreed to a 9% reduction in the purchase price by waiving off the non-compete fee. The two entities together have an 80% stake in Cairn India, which makes it rather evident which way the firm’s shareholder vote (to decide whether the company should agree to the government’s terms) will go. Cairn Energy has already said that it has agreed to the conditions. With the deal likely to go through, Cairn India should soon be able to expand production and fully exploit the potential of its oil blocks. Production is currently stagnant because of the impasse with the government and the joint venture partner Oil and Natural Gas Corp. Ltd. If the deal progresses smoothly from here, investors can expect handsome gains, since there’s a large difference between current crude prices and the crude oil price that has been factored into the stock. Once the higher crude oil price is factored in, the stock should go up.